In the morning of April 6, Mayor Ko Wen-je participated in the “One-Day Community Doctor” and “Taipei City International Community Care Day” events. 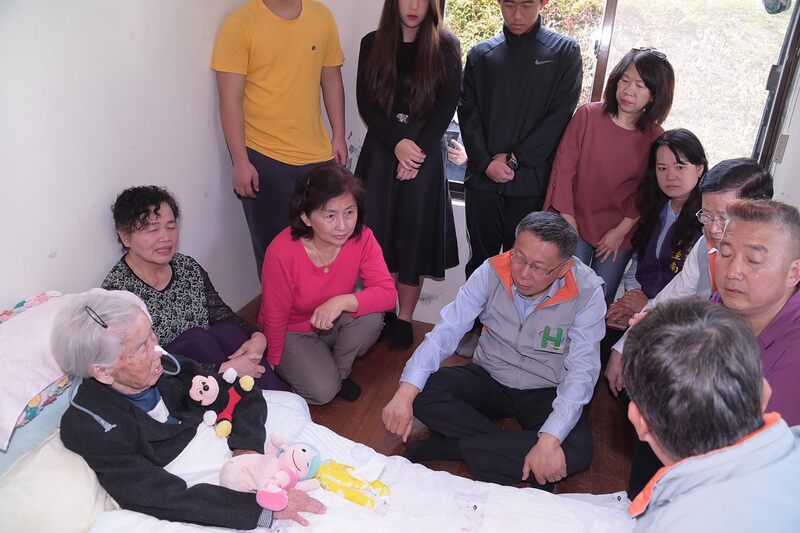 Ko first visited 95-year-old Grandma Chang in Zhinan Village of Wenshan District to listen to the long-term care recipient’s thoughts and needs. He stated that even though the best care model is not fully established yet, we just have to start somewhere. He further acknowledged the tireless efforts shown by the Taipei home care medical team as the team members make doctor visits and perform clinical care at people’s homes. When giving his speech at the Taipei City International Community Care Day event, Mayor Ko mentioned that Taipei City is now becoming an aged society; the population of people aged 65 years old and above will exceed 20% in 3 to 4 years. He cited the National Health Insurance (NHI) as an example: Taiwan’s NHI premium has been rising over the past few years, but the total population of Taiwan has not. Therefore, due to the aging society and the fact that elderly people usually have more health issues, medical fees have been increasing even though Taiwan’s total population has stayed fairly the same. Mayor Ko explained that, Taipei’s disabled elderly population is expected to grow to approximately 58,000 in three years, and how to care for these elderly citizens will be a serious problem that will need attention. Mayor Ko believed that large-scale care centers are more popular in the U.S. where elderly citizens can be looked after in groups. However, in the context of Chinese culture, the elderly will usually refuse to stay at such centers, preferring to remain in their communities or at home. Therefore, Mayor Ko believed that Taipei should focus on developing medical home care, nursing home care, pharmaceutical home care, rehabilitation home care, and hospice home care services. Taipei possesses two advantages in regard to this development: one is having its own comprehensive network of Taipei City Hospitals; and two is the smooth horizontal integration of health and civil affairs resources. The city government has been assuring the tie between its Department of Health and Department of Civil Affairs to be seamless over the years. Our next step now is to brainstorm on how to foster our care services to focus on the needs of locals, communities, and home care recipients! At the end, Mayor Ko also encouraged everyone to work together to solve the problems. He pointed out that, in fact, the issue is not the large number of elderly citizens, but the rapid increase in elderly citizens. When looking at Sweden, for example, it took 130 years for the population of seniors 65 years old and above to grow from 7% to 20% of the total population. Contrary to Sweden’s slow aging timeline, Taiwan has been experiencing a 1% growth every year. The government needs to find solutions for how to interfere and deal with the situation. Mayor Ko confessed that he has not worked out the details, but is hoping to inspire more collaborations between public and private sectors and encourage more comments and feedback, thereby creating an even more comprehensive long-term care system.